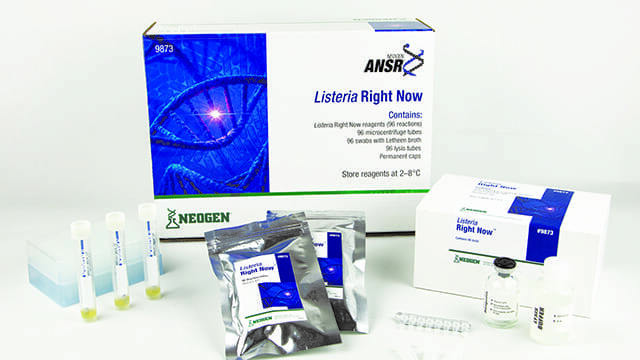 USA – Neogen’s environmental pathogen detection system, Listeria Right Now has received official approval from AOAC, an internationally recognized scientific association. It is a complete system for taking environmental Listeria tests with molecular-level accuracy that requires no enrichment, so there’s no need for processors to grow bacteria cultures on-site. Validated by AOAC and NSF International, the technology allows food production and processing facilities to seek and eliminate Listeria more quickly, which can reduce the risk of cross-contamination of food products, keeping consumers safe. The system provides results in under one hour, much faster than traditional methods, which can take up to several days. “It’s extremely gratifying to receive this approval,” said John Adent, Neogen’s president and chief executive officer. “It comes as the result of a lot of hard work and ingenuity on the part of Neogen’s R&D and validation groups. The test-kit offers rapid tests by using a technology that targets rRNA, which is present in much greater numbers than the traditional DNA target. An isothermal reaction also causes the replication and amplification to occur at a constant rate instead of the normal thermal-cycle technology from traditional PCR systems. The product was declared the winner of the 2018 Innovation Award from the French organization Carrefour des Fournisseurs de l’Industrie Agroalimentaire. This is an addition to the company’s Food Safety Division markets culture media and diagnostic test kits used in detecting foodborne bacteria, natural toxins, food allergens, drug residues, plant diseases and sanitation concerns. Neogen is also recognized for development of animal genomics along with the manufacturing and distribution of a variety of animal healthcare products, including diagnostics, pharmaceuticals, veterinary instruments, wound care and disinfectants.